Bucerias Beach in Nayarit, Mexico. Approximately 25 minutes north of Puerto Vallarta lies the sweet Mexican town of Bucerias. For visitors coming from Nuevo Vallarta and its northern section of Flamingos, Bucerias is within walking distance when heading north along the beach. A fantastic section of soft golden sand fronts the town of Bucerias, with this specific section of Flamingos Beach referred to as Playa Bucerias. Along this wide inviting beach visitors enjoy cool afternoon breezes and savor special spots where the ocean and sand are framed by gorgeous coconut palms. The ocean water along this section of Banderas Bay has surf gentle enough for swimming and body surfing. Another wonderful feature of Playa Bucerias is that it’s much less crowded than some of the more popular beaches within and around the city of Puerto Vallarta, Mexico. The sweet and colorful town of Bucerias, Mexico in the state of Nayarit. Bucerias is a good-sized town that’s quite popular with tourists but thankfully still retains the much of its original ambiance as an old and authentic Mexican village. Colorful bougainvillea line the mixture of cobblestone, paved and dirt-path streets along which stand various sizes of multi-colored homes. Everywhere you look, Bucerias is full of vibrant and delightful charm. From its large open-air flea market to boutique shops selling art and a variety of interesting colorful items, this town has a distinct cosmopolitan flair. Several bars and restaurants face the beach, and a few eateries have chairs and tables right out on the sand. Additional attractions include a beautiful and newly remodeled beachfront town square, a large variety of excellent restaurants, vendors in booths along the streets selling freshly-cooked food. All of these amenities are a short walk inland from the warm sands of Playa Bucerias. 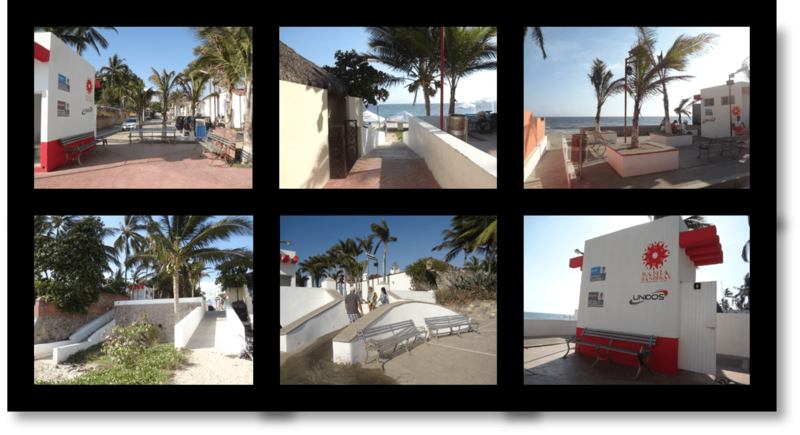 Remodeling and modernization of beach access points in Bucerias, Mexico. The state of Nayarit has just remodeled all of the beach access points in Bucerias with new stairs, ramps, bathroom facilities, showering off areas and cute sitting areas. From Playa Bucerias there are unique views of the whole of Banderas Bay.